As you can see above, the ACC at just over 63 percent ranks in the middle of the pack of the six power leagues over the last 15 seasons at defending home turf. Interestingly enough, home court advantage in the major conferences has not been as volatile as the nation overall. The six high-major leagues have hovered around the 64 percent mark for the better part of the 21st century, which is about five percent higher than it is for the other 26 Division I conferences. As for why home court appears to be more meaningful in the power conferences, there are some logical explanations. Schools in these six leagues generally have the largest arenas featuring the biggest student body sections and the most rabid alumni, creating an electric atmosphere that serves to elevate the home squad and rattle the road team. With almost every major conference match-up now available on national television through a variety of cable platforms, those games are often viewed by fans as special events worthy of catching the eye of a passing camera. Travel is also a consideration. Because of the often long distances between schools in the major conferences, visiting teams must regularly fly to their road games. Conversely, teams in most mid-major conferences can take a short bus ride to its next visit, producing a less daunting road trip. The ACC over the last 15 years has experienced a more significant drop in home court advantage than the six major conferences as a group, but two significant dips — from 2004-06 and 2013-15 — illustrate that there is a pattern in this league. The ACC’s two major expansions added three schools each time. Miami and Virginia Tech joined the ACC in 2005, followed by Boston College in 2006. Notre Dame, Pittsburgh and Syracuse joined in 2014, with Louisville effectively replacing Maryland in 2015 and leaving the ACC in its present form. 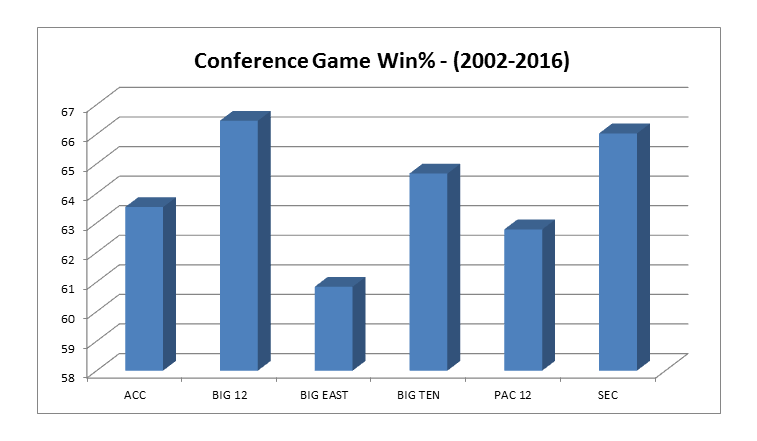 In each instance of major expansion, a significant drop in conference home winning percentage came about. Given the relatively small sample sizes here, this could just be random noise. It could also be that, with its rich tradition of passionate fan bases and rowdy home environments, the ACC needs an adjustment period when there is a major membership transition. In any case, the league’s home teams bounced back nicely to over 65 percent last season, and appear well on its way to a strong home record again this year. 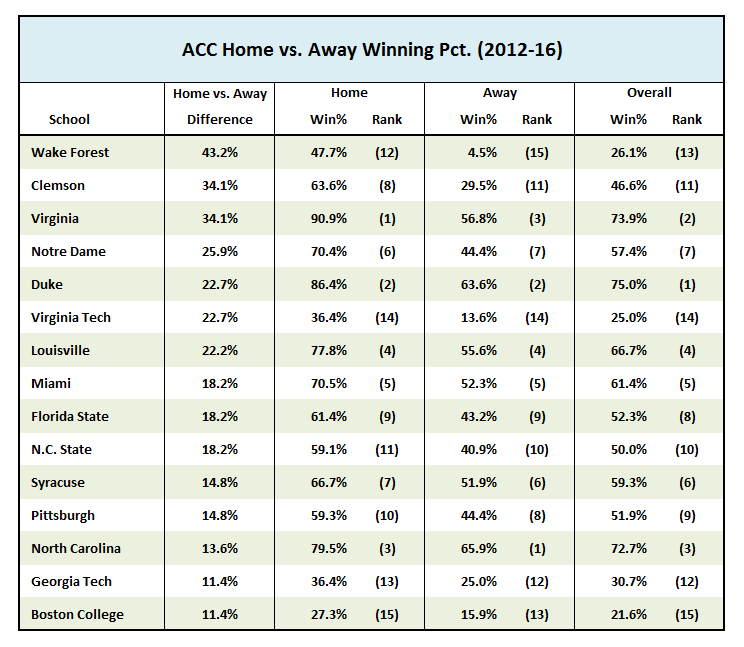 The above table shows how ACC schools perform at home in conference play compared to when they hit the road over the past five campaigns (note: the newer schools only use ACC data). Prior to this year’s win by Florida State at John Paul Jones Arena in Charlottesville, Virginia has proven the toughest spot for ACC opponents to play. Perhaps not surprisingly, the league’s two traditional powers, North Carolina and Duke, are also the ACC’s best road teams. The school with the largest disparity between home and away performance is Wake Forest, largely due to the Deacons’ paltry two road wins over the past six seasons. It also comes as no shock to see that Boston College — despite a 2-0 home record this season — has the weakest home court edge in the league. Conte Forum is rarely, if ever, packed, and ACC foes win there almost three-quarters of the time. Up to this point, we have focused on home court advantage in the ACC. In our next piece, we will take an in-depth look at what happens in the ACC when teams meet twice in the regular season. This entry was posted on Thursday, January 12th, 2017 at 9:01 am by Brad Jenkins (@bradjenk)	and is filed under acc, feature, microsites. Tagged: acc, boston college, duke, home court advantage, north carolina, virginia, wake forest. You can follow any responses to this entry through the RSS 2.0 feed. You can leave a response, or trackback from your own site.